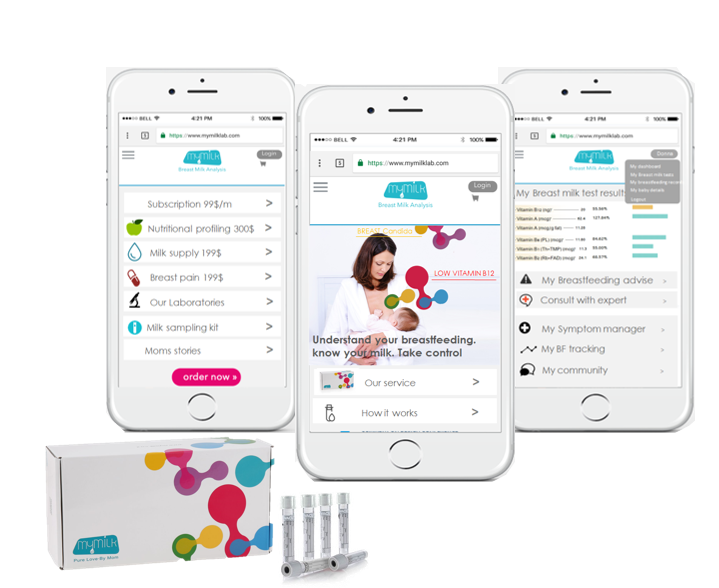 a mother- centered mobile health solution for personal, evidence-based breastfeeding monitoring, based on mother’s own milk bioanalytics. Human milk is a powerful, personal data source reflecting on each mother -infant dyad. MyMilk enable mothers and their healthcare providers to better understand mother’s health and breastfeeding, by utilizing human milk as a non-invasive continuous monitoring tool. Early feedback, , starting at the first days after delivery! Assuring balanced process and in-time intervention in individuals at risk, thereby enhancing mothers and providers control, supporting prolonged milk production and successful breastfeeding and reducing immediate low milk intake complications in the infant (low weight gain, dehydration, jaundice). Monitoring of human milk macronutrient and the relevant micronutrient (key vitamins and minerals), before clinical symptoms arise thereby promoting mothers peace of mind, and promoting preventative care and baby wellness. 3 simple steps. Online ordering and survey. Small Milk sample to MyMilk kit. Get result online. 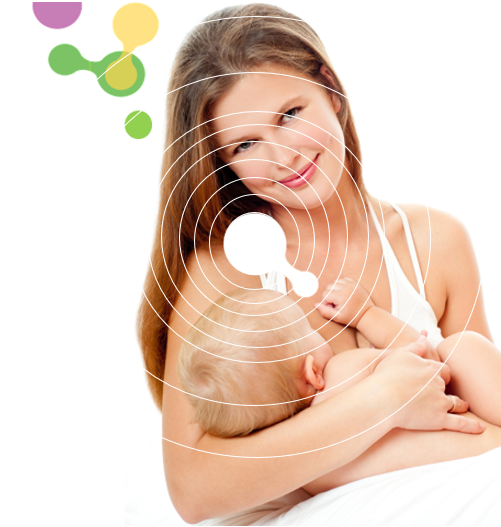 Mymilk develop breastmilk scanner and app for on the spot breast milk analysis, at the mother’s home, enabling fast, easy, and continuous breastfeeding and breast milk monitoring. MyMilk scanner 1st application is early monitoring of breast milk production, starting at the first day after birth! System allows monitoring of breast milk production process, identification of delayed onset of bulk milk production and early identification of individuals at risk for low milk supply (enabling in-time and correct interventions, promoting breastfeeding success, copious milk production and prevention of low milk intake complication like dehydration and excessive weight loss). Mymilk R&D team work with technological companies’ development teams for future applications of next generation sensors, that are intended to be integrated as core smartphone technologies. Our experts are working on new innovations generating better solutions for new moms to monitor their breastfeeding and baby’s health. PERSONAL ACTIONABLE INSIGHTS FOR NEW MOMS. 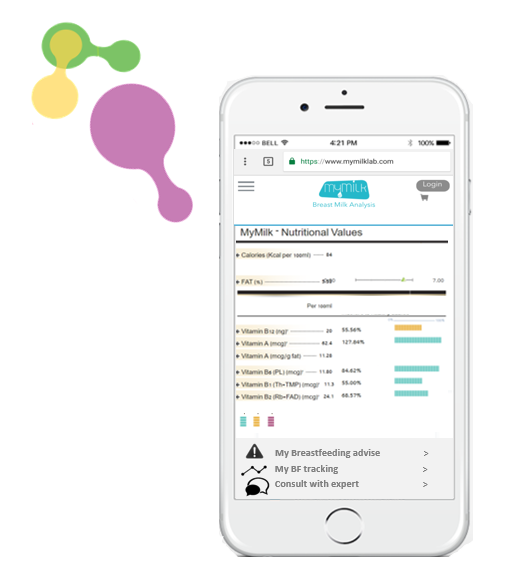 Mymilk information system integrates mother and infant information with bioanalytics, from breast milk and blood tests, to generate actionable, personal insights. Mymilk algorithm is fed by scientific information, clinical guidelines and in-house generated database and AI. From nutritional wellness to better breastfeeding practice, for longer and healthier breastfeeding. From breast pain, to low milk supply diagnosis, for guidance intervention & treatment. Generating insights and alerts also to the mother’s healthcare providers, for in-time and better professional guidance. Moms say that our solution SAVED their breastfeeding. Helped them to take control. To guide their treatment. To Manage their concerns and complication. Get on-top of their health and wellness. And to be empowered by knowledge. Mobile health, consumerization of healthcare, and invasion of technology disrupt today health management, democretizing healthcare and driving better and preventative personal care. Mobile health market Grew from non-existing market to a $7B market 2015, $23B market 2017 (42% increase, and projected to reach $104B at 2023, and 189B at 2025 (CAGR 32.3%) (Research and Markets, November 2017). Millennial MOMS are early adopters, and 57% of mobile health users also have pregnancy related apps (Grail research, 2015). Prenatal testing is evaluated to get $7.2B by 2022 (research and markets 2016 (CAGR 28%), where NIPT DNA prenatal testing projected to reach $5.5B by 2025 (Grand view research 2016). Today, almost every new mother start breastfeeding. as direct and indirect healthcare losses (LANCET 2016).